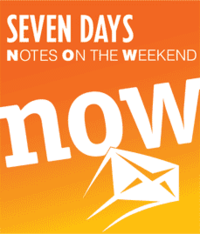 In January, Seven Days started publishing a weekly email newsletter, called NOW, which stands for Notes On the Weekend. I say Seven Days publishes it, but it's really me who puts it all together and sends it out to everyone (with invaluable design and technical help from 7D Creative Director Don Eggert). In yesterday's newsletter, I included a request for feedback from subscribers, alongside my doofy picture. If people fill out our NOW feedback form by Tuesday at noon, they get included in a drawing for a $35 gift certificate to Three Tomatoes in Burlington. So far, the response to my plea has been fantastic, and I have to admit, I'm a little surprised. I was really skeptical about doing this newsletter when I first heard the idea. I get several email newsletters, and honestly, I rarely read them. But this one seems more fun to me — of course I can't tell if that's because it really is, or because I'm the one responsible for it. So it's encouraging to see so many emails from people saying they find NOW useful and interesting. It's so weird to send out an email to thousands of people every week and never hear back from them. It's heartening to hear that I'm not just spewing fluff into the yawning, measureless void of the internet. Anyhow, thanks. And if you're not getting NOW, you can sign up on the Seven Days homepage. Feel free to let me know what you think in the comments section of this post, but if you want to get entered into the Three Tomatoes drawing, you have to subscribe and fill out the feedback form. My only complaint about this past issue was that there wasn't a mention of Outright's Silent Auction tonight. But I know you can't include every single thing happening in the Champlain Valley in every NOW. Can I plug it here? Outright Vermont's Annual Not So Silent Auction! Friday, March 30th 6:30pm at 1 Main St. in Burlington, VT Our annual silent auction contains the most eclectic spread of items around. Come bid on over 200 products, goods, and services from local Vermont business..
Tickets are $10 advance or $15 dollars day of and can be purchased by calling the Outright Vermont office: 802.865.9677 This event nearly sold out last year, so don't miss your chance to get some fabulous art or other snazzy items WHILE supporting queer youth!